See the gallery for quotes by Ayumi Hamasaki. You can to use those 8 images of quotes as a desktop wallpapers. I have trouble voicing my thoughts... I can't communicate very well that way. It's hard to decide how to match words to music. It's not like it's twice the work. It's always difficult for me to explain to the composer what I'm looking for. I'm not a professional; I lack even basic knowledge about writing music. I always like whatever I did most recently. It's the closest to who I am at the moment. I don't have dreams. How can I say it? I myself am a dream. I understand it's my role to realize people's dreams. I understand it's my role to realize people's dreams. I'm O.K. with that so long as my songs are my own. No one can take my songs away from me. I'm not a professional; I lack even basic knowledge about writing music. If I write when I'm low, it will be a dark song, but I don't care. I want to be honest with myself at all times. If there are rules and regulations, I can't help it, I want to break them. It is necessary that I am viewed as a product. I am a product. The way I work, typically, I do everything at the very last minute. The way I work, typically, I do everything at the very last minute. Even if I was given two months, I'd do it in the last three days. I'd heard a lot of Asian people were rooting for me, but I had no idea. I was stunned. They were... impassioned, especially compared to Japan. I couldn't even have anticipated that kind of welcome. All too often, legacy management practices reflexively perpetuate the past - by over-weighting the views of long-tenured executives, by valuing conformance more highly than creativity and by turning tired industry nostrums into sacred truths. An adaptable company is one that captures more than its fair share of new opportunities. It's always redefining its 'core business' in ways that open up new avenues for growth. An uplifting sense of purpose is more than an impetus for individual accomplishment, it is also a necessary insurance policy against expediency and impropriety. As the great grandchildren of the industrial revolution, we have learned, at last, that the heedless pursuit of more is unsustainable and, ultimately, unfulfilling. Our planet, our security, our sense of equanimity and our very souls demand something better, something different. 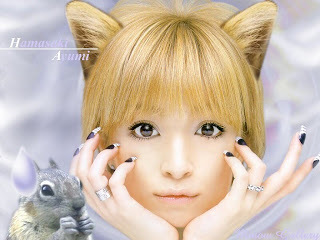 Much more quotes by Ayumi Hamasaki below the page. At the heart of every faith system is a bargain: on one side there is the comfort that comes from a narrative that suggests human life has cosmic significance, and on the other a duty to yield to moral commands that can, in the moment, seem rather inconvenient. I live a half mile from the San Andreas fault - a fact that bubbles up into my consciousness every time some other part of the world experiences an earthquake. I sometimes wonder whether this subterranean sense of impending disaster is at least partly responsible for Silicon Valley's feverish, get-it-done-yesterday work norms. I'm a capitalist by conviction and profession. I believe the best economic system is one that rewards entrepreneurship and risk-taking, maximizes customer choice, uses markets to allocate scarce resources and minimizes the regulatory burden on business. I'm not one of those professors whose office is encased floor-to-ceiling with books. By the way, I think academics do this to intimidate their visitors. In most companies, the formal hierarchy is a matter of public record - it's easy to discover who's in charge of what. By contrast, natural leaders don't appear on any organization chart. In most languages, 'control' is the first synonym for the word 'manage.' Control is about spotting and correcting deviations from pre-defined standards; thus to control, one must first constrain. In most organizations, change comes in only two flavors: trivial and traumatic. Review the history of the average organization and you'll discover long periods of incremental fiddling punctuated by occasional bouts of frantic, crisis-driven change. Large organizations don't worship shareholders or customers, they worship the past. If it were otherwise, it wouldn't take a crisis to set a company on a new path. Most companies don't have the luxury of focusing exclusively on innovation. They have to innovate while stamping out zillions of widgets or processing billions of transactions. Most of us do more than subsist. From the vantage point of our ancestors, we live lives of almost unimaginable ease. Here again, we have innovation to thank. Most of us understand that innovation is enormously important. It's the only insurance against irrelevance. It's the only guarantee of long-term customer loyalty. It's the only strategy for out-performing a dismal economy. Over time, a successful company will acquire much in the way of resources and momentum, and these things often insulate it from reality once it has stopped being successful. Remarkable contributions are typically spawned by a passionate commitment to transcendent values such as beauty, truth, wisdom, justice, charity, fidelity, joy, courage and honor. The real damper on employee engagement is the soggy, cold blanket of centralized authority. In most companies, power cascades downwards from the CEO. Not only are employees disenfranchised from most policy decisions, they lack even the power to rebel against egocentric and tyrannical supervisors. To create an organization that's adaptable and innovative, people need the freedom to challenge precedent, to 'waste' time, to go outside of channels, to experiment, to take risks and to follow their passions. While one should never underestimate the ability of risk-besotted financiers to wreak havoc, the real threat to capitalism isn't unfettered financial cunning. It is, instead, the unwillingness of executives to confront the changing expectations of their stakeholders. The biggest barriers to strategic renewal are almost always top management's unexamined beliefs. At the pinnacle of great design are products so gorgeous and lust-worthy that you want to lick them: a Porsche 911, Samsung's Luxia TV, an Eames lounge chair or anything by Loro Piana. An enterprise that is constantly exploring new horizons is likely to have a competitive advantage in attracting and retaining talent. Fact is, inventing an innovative business model is often mostly a matter of serendipity. I am an ardent supporter of capitalism - but I also understand that while individuals have inalienable, God-given rights, corporations do not. In a well-functioning democracy, citizens have the option of voting their political masters out of office. Not so in most companies. In a world of commoditized knowledge, the returns go to the companies who can produce non-standard knowledge. In an ideal world, an individual's institutional power would be correlated perfectly with his or her value-add. In practice, this is seldom the case. It's important to remember that innovators in business don't always get a platform. Like a child star whose fame fades as the years advance, many once-innovative companies become less so as they mature. Obviously, you don't have to be religious to be moral, and beastly people are sometimes religious. Online hierarchies are inherently dynamic. The moment someone stops adding value to the community, his influence starts to wane. Power has long been regarded as morally corrosive, and we often suspect the intentions of those who seek it. The fact is, society is made more hospitable by every individual who acts as if 'do unto others' really was a rule. Top-down authority structures turn employees into bootlickers, breed pointless struggles for political advantage, and discourage dissent. When a politician bends the truth or a CEO breaks a promise, trust takes a beating.